The maker of electronic control devices (ECD) Taser Int. 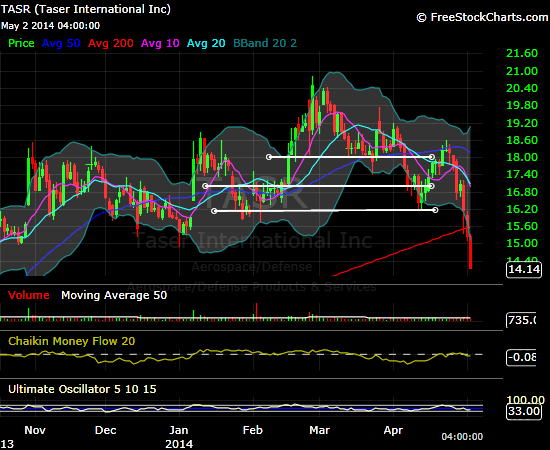 (TASR) has been punished by investors these last two days. If you are invested in this company, should you be worried, dump your stocks and run away or is this a great opportunity to add more shares? Taser existed as a company even when I was a kid and had no clue that such company even existed, but I knew a word “taser” or “to be tased” (not sure if I am spelling it the right way). The brand name itself became a word for action of self-defense (in 70s and 80s) using equipment different from guns. In countries with very strict anti-gun policies, Taser equipment (or guns) were the only allowed means of defense. The name Taser has evolved the same way as Google and “google it” is evolving today. If you check Taser’s competitors, you won’t find many. You actually won’t find any competitor in Aerospace & defense industry which would directly compete with Taser. Some listed competitors are National Presto Industries (NPK), Smith & Wesson Holding Corporation (SWHC), and Sturm, Ruger & Company, Inc. (RGR). If you find any others, let me know. But look at what those listed competitors produce. All is guns or ammunition. No one is in the same branch as Taser. In areas where people and enforcement prefer non-gun equipment, Taser seems to be the only solution. And here is the part, which baffles me the most – 1st quarter results. Taser reported quite up beating results with a strong outlook for the year and yet the stock tanked by 13% within last two days. What point am I missing here? Is a slight miss in EBIDTA this quarter a justification for such punishment? I am not convinced and think all this is just a craziness of Wall Street. In short, Taser reported 0.06 EPS vs. estimated 0.04, revenue came in $36.2M vs. $34.03M and sales were up by 19%. Shouldn’t this be a reason for celebration and not a sell off? I listened to a earnings conference call and I couldn’t find any disturbing items justifying such sell off. Warren Buffett always says that an investor should be fearful when others are greedy and greedy when others are fearful. Is this the case with Taser? I remember when Taser was trading at $9 a share. I actually opened a covered call against this stock that day. You can check my Taser trades in this archive. Then the stock plummeted to below $6 a share. I bought more shares and sold another covered call trade against this stock. I made 11.81 and 13.47% gain those days. Is it time to repeat this move? Is Taser again providing with a buy opportunity? I believe so. I would however wait with opening a new position or adding more shares for this frenzy selling to end. It still may continue down and we do not want to lock our precious cash in a falling stock. As you can see, selling gained a momentum and that may trigger more selling as stop loses get hit. So it would be wise to wait for a reversal. It may happen early next week, at its end or later. I am definitely ready for selling more puts against this stock should the reversal happen. I also have a few existing contracts against this stock. To keep up with the market I rolled them down. I bought back my 4 old contracts and sold 10 more new contracts to offset the buyback. I sold with a lower strike, but same month. Time will show what would happen next, but I remain positive.